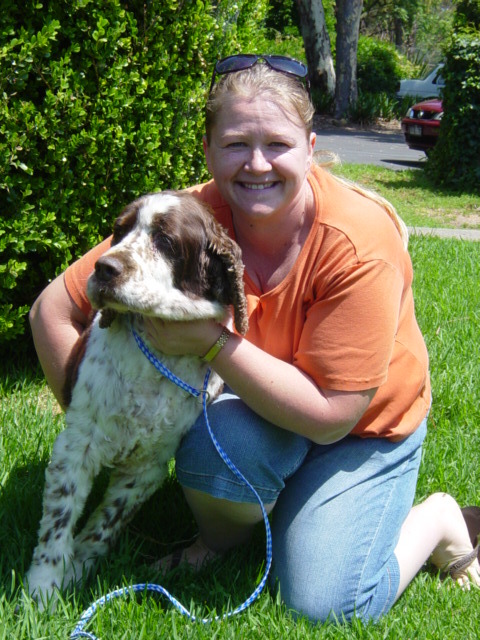 This lovely English Springer Spaniel male was found roaming the streets near Fairfield in Sydney recently. He spent a short time at an animal shelter until his final day, when we collected him as a rescue dog of the club (Fri Nov 17, 2007). He really enjoyed his hydrobath and appears to have an excellent temperament. Sam (as we named him) is approx 8-10 yrs old, desexed, fully vaccinated, wormed, vet checked and now microchipped. He is in good health for his age. He was placed in the safe hands of a club member temporarily in the hope that there is a permanent new home for him just around the corner. Maybe you can help ? The day after I collected him from death row, I started to call local grooming salons in the area where 'Sam' was found and I hit the jackpot ! The groomer I spoke to had a client who had lost her Springer. Within minutes I had his owner Kim on the phone in tears. 'Jax' aka Sam to us, had gone missing in early October and after several weeks of searching Kim had lost all hope. Yvonne and I were pleased to re-unite them together the day following his rescue. 'Jax' is 10 years old in February and had his young family to greet him. His maltese playmate will be thrilled to see him, Kim tells us.